I've had this posting in my head for a number of years, and for whatever reason, it's been percolating even more so lately. That's probably a sign that I need to "work out the poison". For the record, I write this as someone who probably owns more books on religion and religious thought that most non-clergy folks. 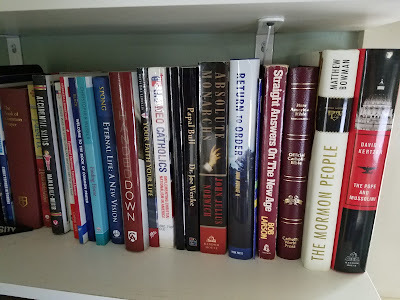 I mention my small book collection not because I want to impress...or whatever the opposite of impress is...anyone, but more so just to make a point, namely that I do think about the bigger things in life (this life and maybe the next one) often. And I do seek answers, although I also confess that for the most part, my searching tends to yield more questions than anything else. Much of how I see and seek things in the area of faith and religious thought comes from how I was raised. My mother, born a Baptist (or so I believe) converted to Catholicism in the early 1960's. While pretty busy as a poor single parent, she never the less insisted that her boys attend church ever Sunday. We were also altar servers for many, many years, and three of us Albert boys attended a Catholic high school, more or less in spite of my mother's ability to actually pay for it. From a religious formation perspective, I think we got the standard drill, or as Mother Angelica would later call it, "Catechesis". For me, it was so well ingrained that I was able to become the president of the Catholic students group my senior year of college. So where did things fall off the rails? Thinking back to when I was far thinner (both in weight and in critical thinking skills), the over-riding word that would describe growing up Catholic was "stern". In our parish, we had a stern older priest who didn't actually seem to like kids all that much. The parishioners didn't seem to like kids all that much either. I remember stern lectures from the pulpit about the noise made by kneelers going up at inappropriate times, about folks who would leave the church right after receiving communion, about countless other items. For a church building that was actually (in hindsight) pretty beautiful from an aesthetic perspective, it was not such a beautiful place to be in, truth be told. The standard rub you hear about Catholics, by the way, is that it's too much about rules and regulations. A kind of "paint by numbers" mentality towards the hereafter, whereby if you just do the right things, if you go through the right motions, somehow your celestial punch-card will be sufficiently full as to allow you to sit on a cloud after you die. I get that criticism, and on one level I even agree with it, but it was never the thing that really made my Catholic upbringing so unattractive in the rear-view mirror. The retrospective has afforded me the luxury of seeing a much bigger paradox: For a place that somehow celebrated a loving God, it was just not a very happy or loving place. As I said, a stern place lead by a stern priest, and full of stern and unwelcoming people. As a young kid, it wasn't shocking that I also viewed God in this kind of stern light. Now I did meet more than a few wonderful priests both back and since then, but as a young kid, the happy and engaged priest was the exception, not the rule. A byproduct of my Catholic upbringing was a kind of latent fear of being anything other than, well, a Catholic. While I've always loved reading about other religious philosophies (as a teenager I read every single book the Scranton Public Library had on the Mormon Church), even as a kid I could never make the leap away from being a practicing Catholic. I was in my 40's before I stopped going to church on a semi-regular basis. Why then? I suspect it was more to do with a lot of the pressures I had back then in my life, with the underlying nut being that this thing that was supposed to bring me comfort...namely a religious faith...didn't. As I've written on the blog before, there was also the issue of divorce that I had to later contend with, but by the time that issue crept up in my life, well, the ship had already sailed. There's been a lot written (including a very insightful Pew study you can link to HERE) that goes into detail about the decline of organized religion in the United States. Maybe what I've written here is mirrored by others, and quite frankly I don't have the time or the energy to see if that's actually the case. In a sense that line of thought really doesn't matter anyway, as while religion is a collective action, it is also inherently a deeply personal one as well. 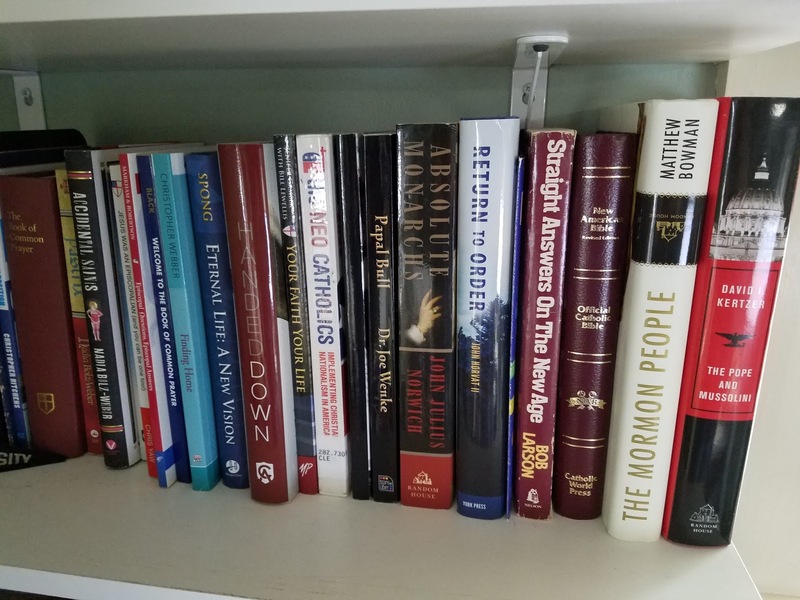 My 40 years of trying to find at least one answer in the faith of my upbringing left my pretty empty handed, but certainly not bitter. If anything, I have tremendous admiration for those that actually do find answers (or at least comfort) in their faith. That's a super-power that I lack. It would be easy from the above text to think that I'm angry or disillusioned with organized religion, but that's actually not the case. In fact, I think I have more admiration for organized religion now than I ever had in the past. While as a kid what I saw was a sea of sternness, now I actually know people that find answers and comfort in their faith, regardless of the actual faith (including Catholics). That's a good thing. Me? I'm just going to keep reading.